When I try to export with Photoshop or use other online GIF makers, they always end up with the ugly white halo. What makes Gifmaker.org so different, and how can I replicate it in Photoshop or Adobe Effects? The problem is that GIF has no alpha channel that can show semi-transparent colors. For that you would need to save as PNG24. With a GIF, antialiasing inevitably comes with a halo. 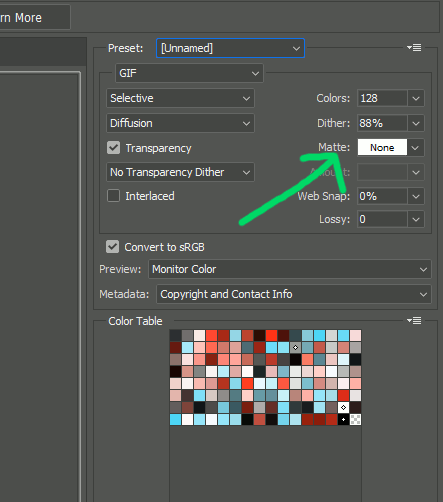 If you don’t want antialiased edges in a transparent GIF, then you should set the setting Matte to None in the Save for web Panel. (Alt+Shift+Ctrl+S). Not the answer you're looking for? Browse other questions tagged adobe-photoshop export animation gif adobe-after-effects or ask your own question.